The elderberries ( Sambucus canadensis) are ripe, so yesterday I picked enough berries to make the first batch of tincture. 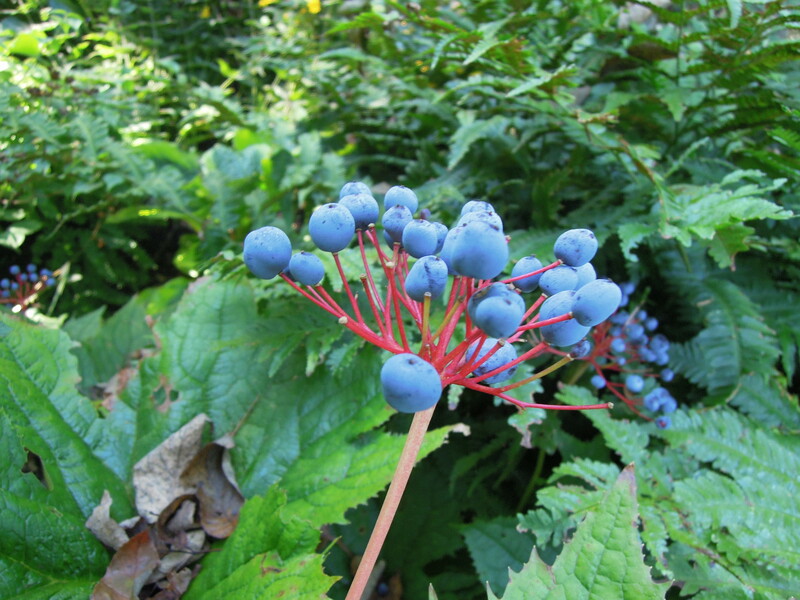 Elderberry has a long history in herbal medicine. 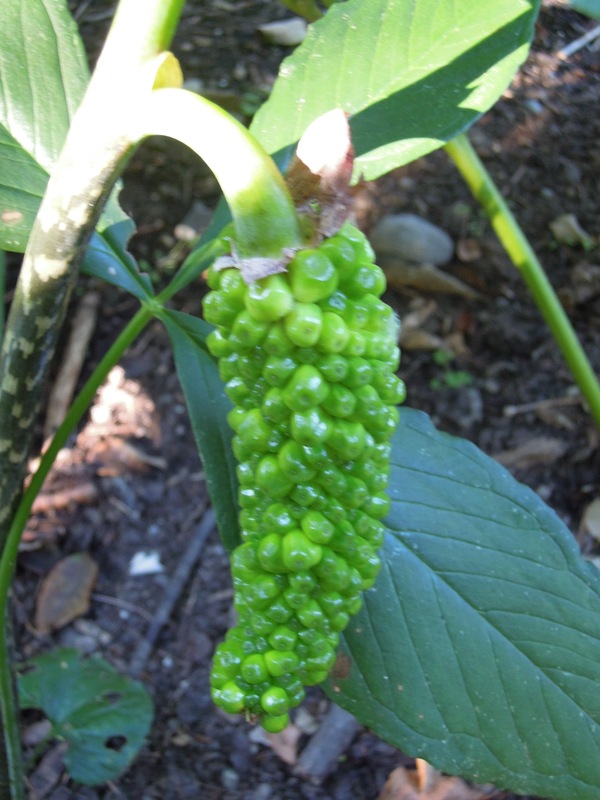 It is used as a super immune booster, and as a cure for colds, coughs, and the flu. Because it is full of antioxidants, as well as flavonoids, it can be very useful in fighting off bacterial and viral infections. 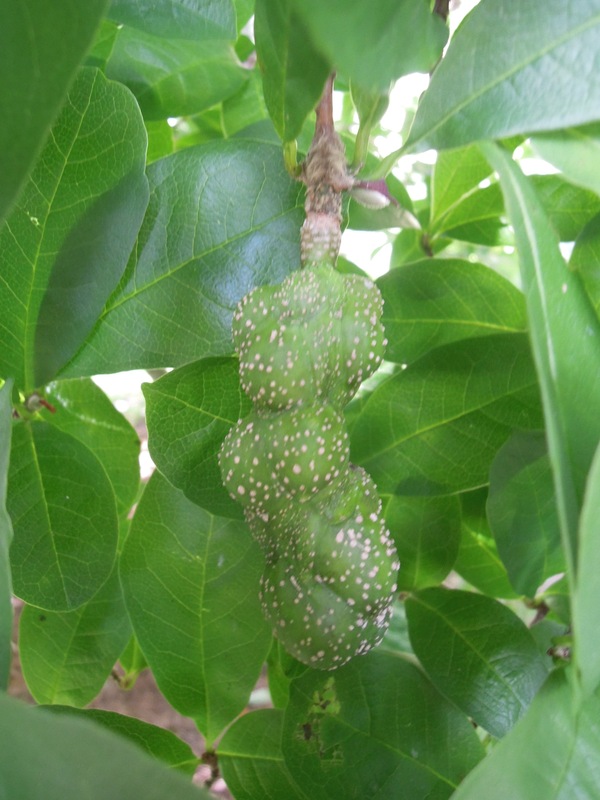 The presence of flavonoids help to protect against cell damage. Elderberry is high in vitamins A and B, and contains lots of vitamin C. We use elderberry in two ways. We either make a tincture or we make elderberry cough syrup. We make a tincture using fresh berries and alcohol. A tincture is a heavily concentrated extract made from steeping ( but not boiling) medicinal herbs or plants in either alcohol or glycerin. To make an elderberry tincture, I fill a mason jar with half of the picked berries. I then fill the rest of the jar by pouring 100% vodka over the berries, leaving about an inch or so of head room. I close the jar and shake it up. The jars get labled and put in a cool, dark place for about 4-6 weeks. Our pantry stays pretty cool and it is rather dark, so this is a good place to store any of our tinctures. After 6 weeks, we strain the contents of the jar through a fine cloth, and discard the berries. We then pour the remaining tincture ( just liquid) into another (sterilized) mason jar. Again, we label the jar and store it in the pantry. When we feel a cold or flu symptoms coming on, we take about a teaspoon of the elderberry tincture three times a day. It definitely helps. To make cough syrup, we put 1 cup of the elderberries into a pot with 4 cups of water, a couple of cinnamon sticks and 1-2 piecies of raw ginger. We bring this to a boil and then turn the heat down to simmer for about 45 minutes, or until the liquid has been reduced by one half. 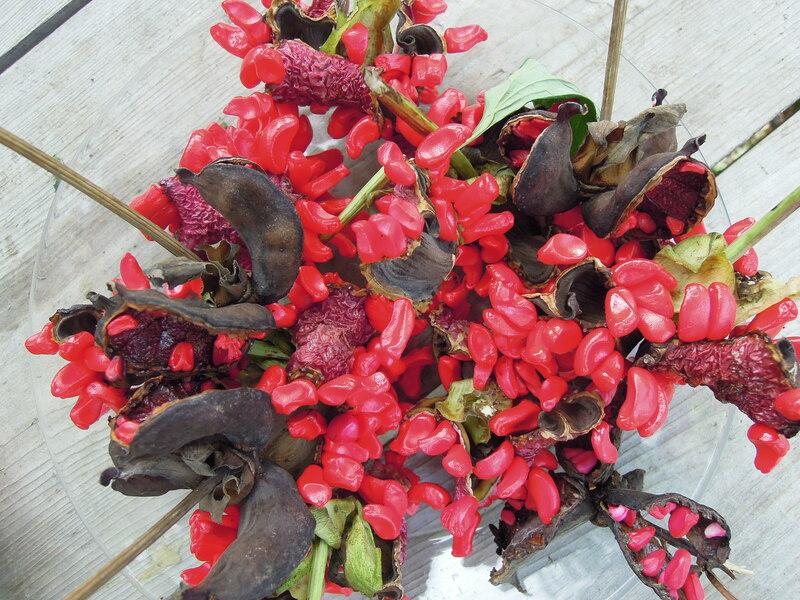 We strain this through a fine cloth, discarding the berries and cinnamon stick and what is left of the ginger. Once it has cooled a bit, we mix the liquid with 1 cup of honey. This goes into a mason jar and is stored in the fridge. When we have a cough, it’s what we go for. 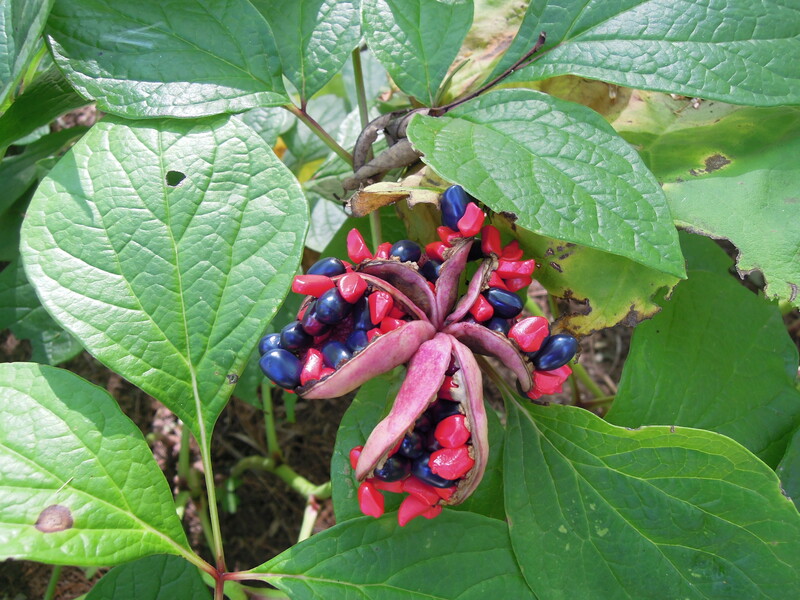 Keep in mind that Sambucus Canadensis, the American elderberry, is the edible variety. 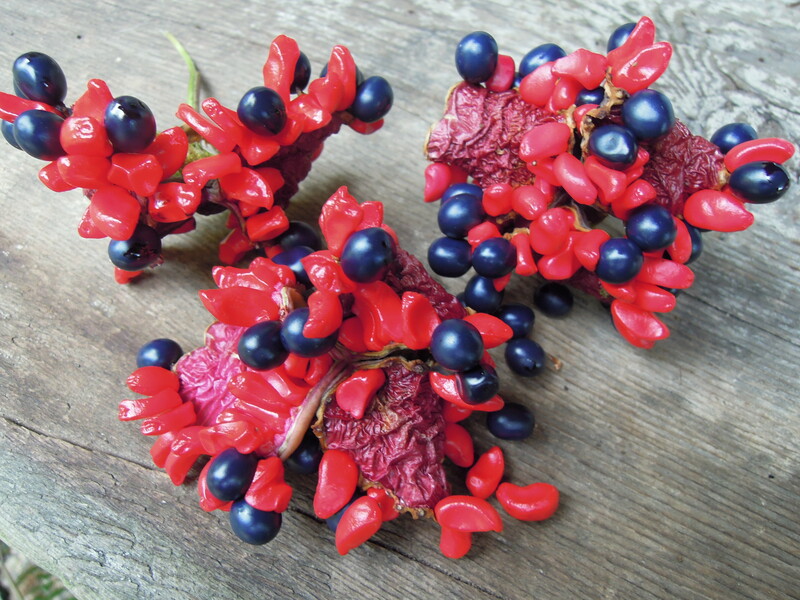 There are red elderberries, Sambucus racemose, which are poisonous. 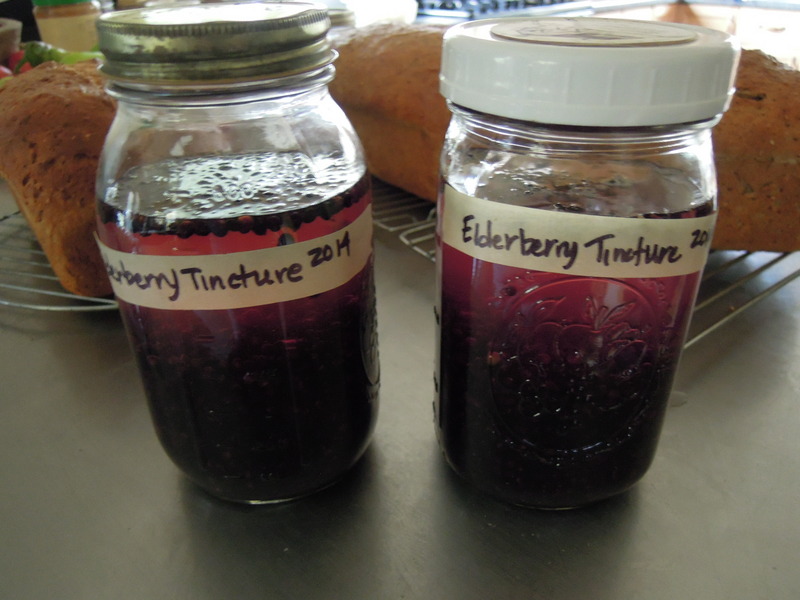 If you are planning to make a tincture or a cough syrup from elderberries….be sure you have the right variety. 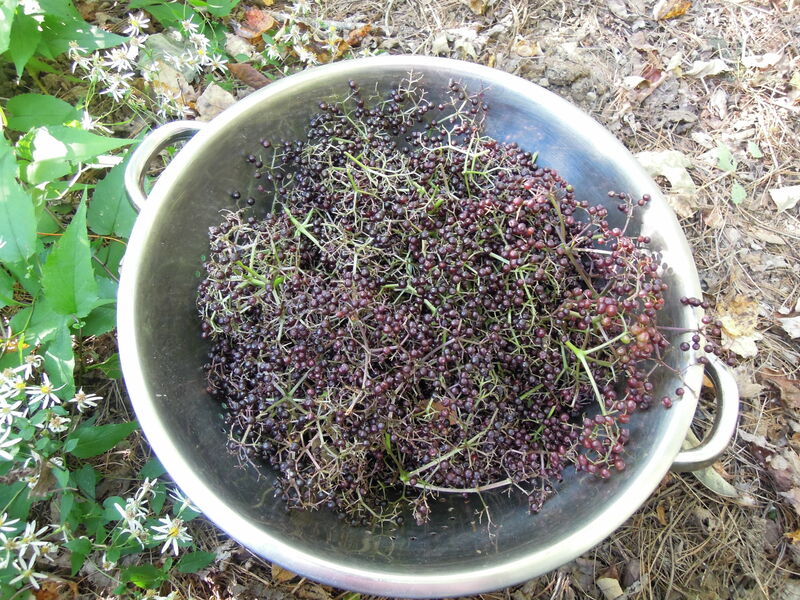 Ours are growing wild here on the property, but you can purchase elderberry at various nurseries. I am happy to say that this year, unlike some others, we got to the elderberries before the birds did. We are still waiting for some of the berries to ripen, and these will be picked for cough syrup. However, I just want everyone to know….I’m not planning on getting any colds or the flu this winter. Wish me luck! There are still plenty of hand dyed Blue Face Leicester skeins of yarn available. 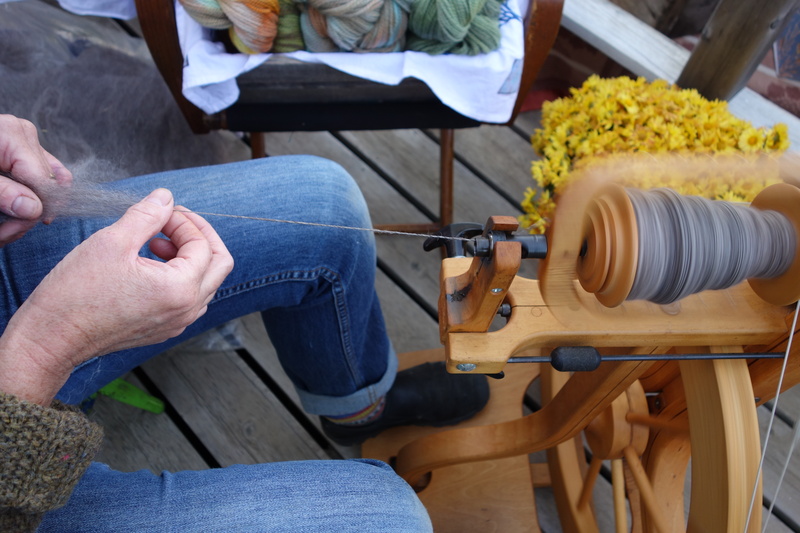 Visit the nursery while we’re still open ( the end of September and then by chance or appointment thru October) if you’d like some soft and lustrous wool to knit with. You can also contact us, if you are coming just to purchase yarn. I have been knitting almost daily and so glad to be back at it. Outdoor work continues. We love being in the nursery at this time of year. Of course some of the native plants are going dormant, or have already, but the cool autumn days are a delight to work in, and we enjoy tending to the plants that remain. 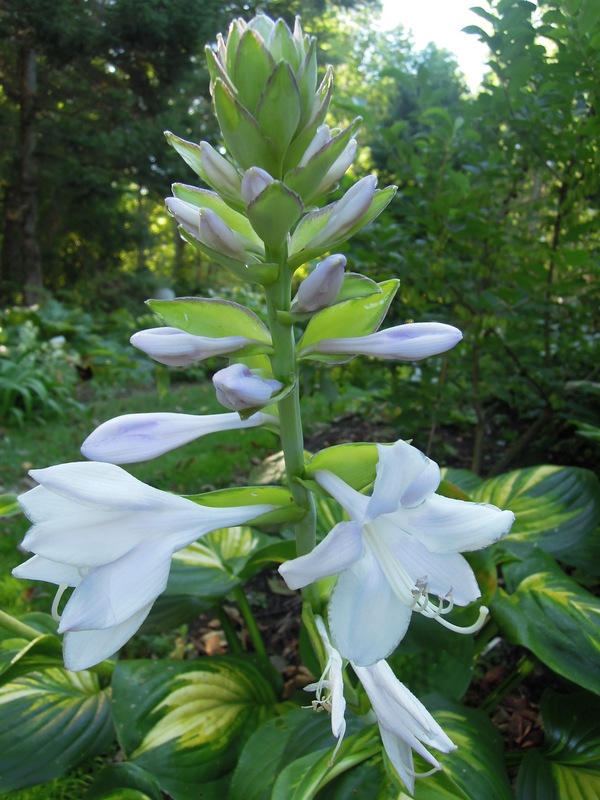 The hostas still look great, and many late blooming natives continue to put on a show. The vegetable gardens are getting a dose of sheep manure and compost, the beds turned over for next year. But, in the hoop house, things are just at their early beginnings……a new crop of spinach is coming along, mixed greens and lettuces are close to the picking stage, and another bunch of radish are close to being harvested. At the other end of the hoop house, there are still a few tomatoe plants producing and peppers that are waiting to turn red. Still, more food! In the evenings, after the chores for the day are complete, knitting and some spinning become my ‘after hours’ activity. Our days are busy with cleaning up garden beds, we are still planting some last minute things in the display beds, and garlic will go in over the next two weeks. We refuse to let anything get caught in one of those early autumn frosts. So, each night Rick checks his trusted weather source for temperature dips, and we make our evening rounds covering the last of the vegetables hoping to eek out a few more days ( weeks) before we really have to call it a season. 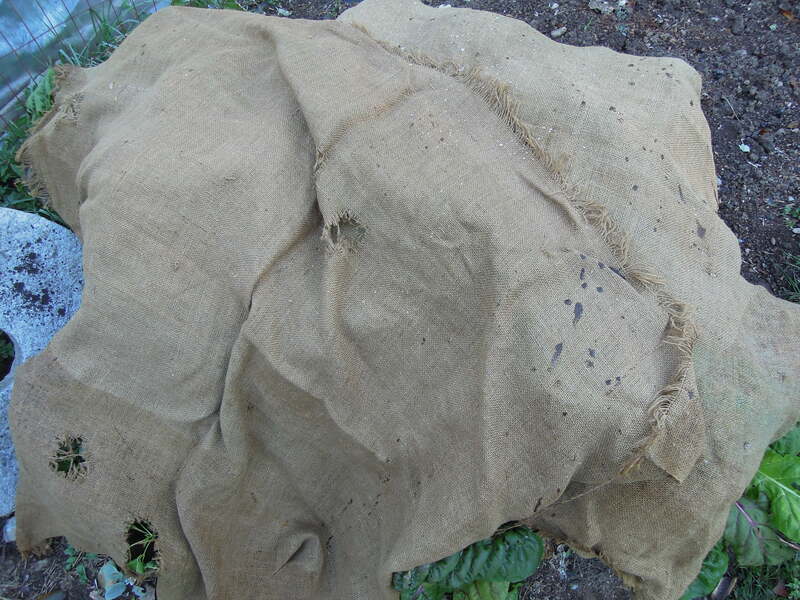 At night our gardens look a bit like a Halloween display, sheets and burlap ghosts lay still around the farm, the last of the chard, winter squash, broccoli, and cabbages tucked warmly underneath. 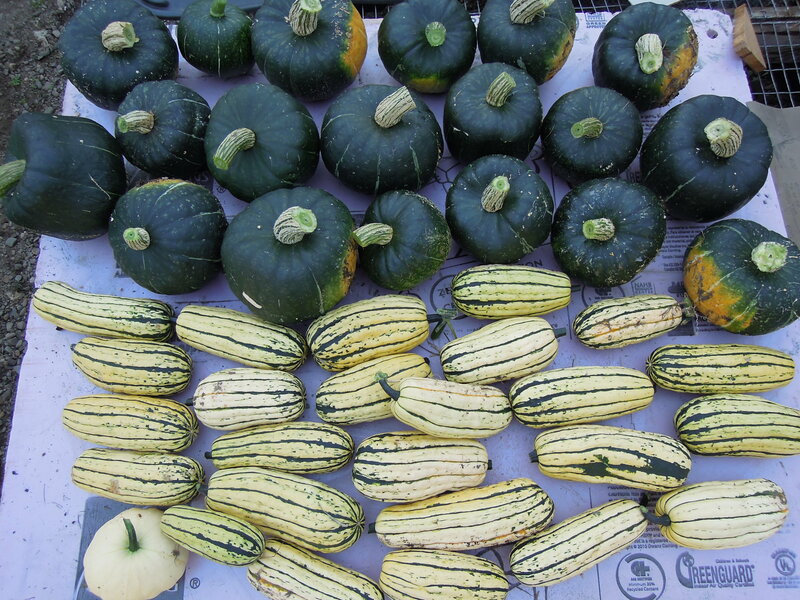 As the winter squash fully ripens, we haul them in and place them in the greenhouse to cure. In early August we feel almost an overwhelming burden with all there is to pick and preserve. Now, knowing our short growing season is nearing its end, we treat the gathering of this last bounty with a new reverence. Oh, is that a little zucchini still clinging to its vine? How delightful. A few more sprigs of basil that have escaped the nightly frost? Bring it in, more pesto! What’s still left to pick in your gardens? I spent part of this morning making a batch of granola bars. Noah almost always takes one ( or two) to work for a mid morning snack. Often here at the nursery, in the late afternoon, we need a little ‘pick me up’ to go along with our tea. 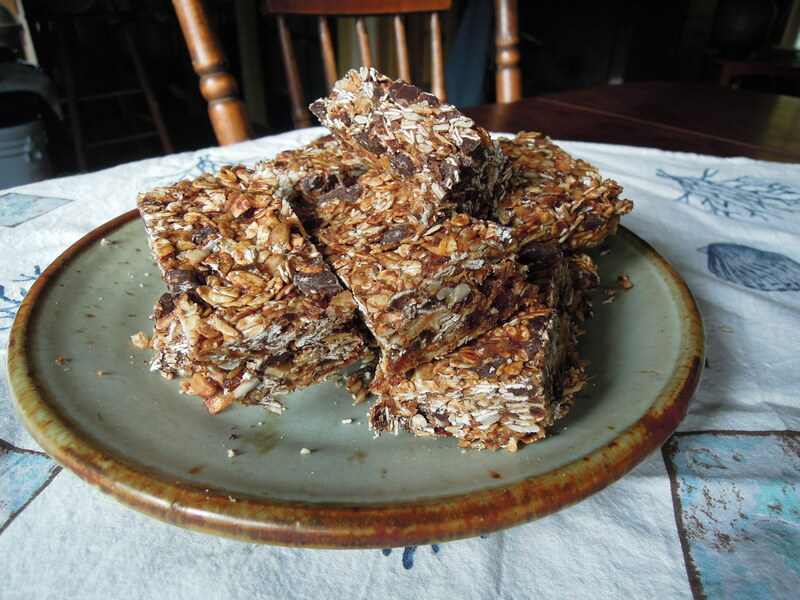 Granola bars are often the perfect thing…..a little nibble to restore our energy. Store bought granola bars can be expensive and often they contain high fructose corn syrup and other not so lovely ingredients. So, we make them at home, and the best part….no cooking required! Our recipe ( which was once passed on to me from who knows where) goes like this: First we toast about 2 cups of organic rolled oats along with 1 cup of nuts, toasting is optional( 350 degrees, about 10 minutes). Most often we use sliced almonds. Then we mix together 1/4 cup of peanut butter, 1/4 cup of honey ( or maple syrup), 1 cup of very finely chopped dates ( done in food processor), and about 1/2 cup of some other seeds or nuts. We usually go for sunflower seeds. This all gets mixed with the toasted oats and almonds. We then press it into an 8 by 8 baking pan and let it sit a bit to harden. Some time spent in the refrigerator helps with this. 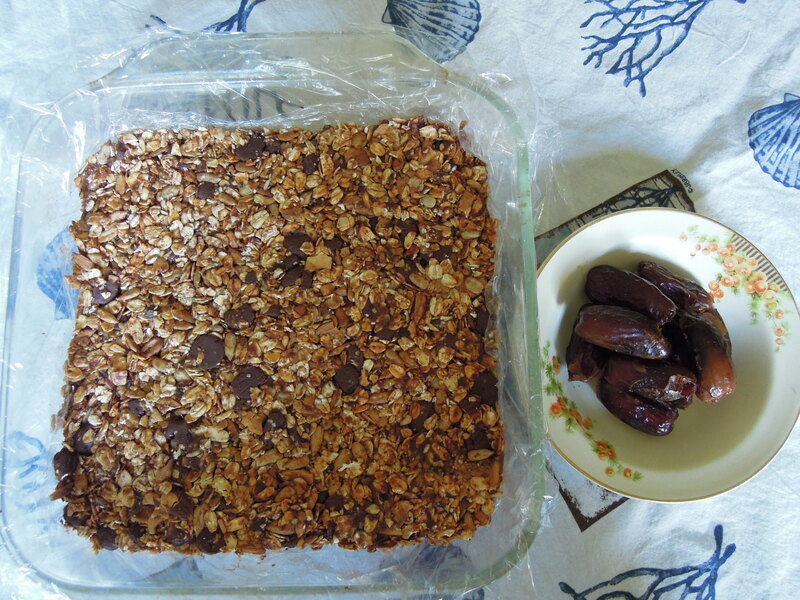 A layer of parchment paper or saran wrap in the bottom of the pan helps to keep the granola bars from sticking too much. These are really tasty granola bars and super easy to make, and just one more thing we don’t have to buy at the grocery store. Yeah! Starting in August, some cultivars of hosta start to display blooms that are overall larger than most and also quite fragrant. 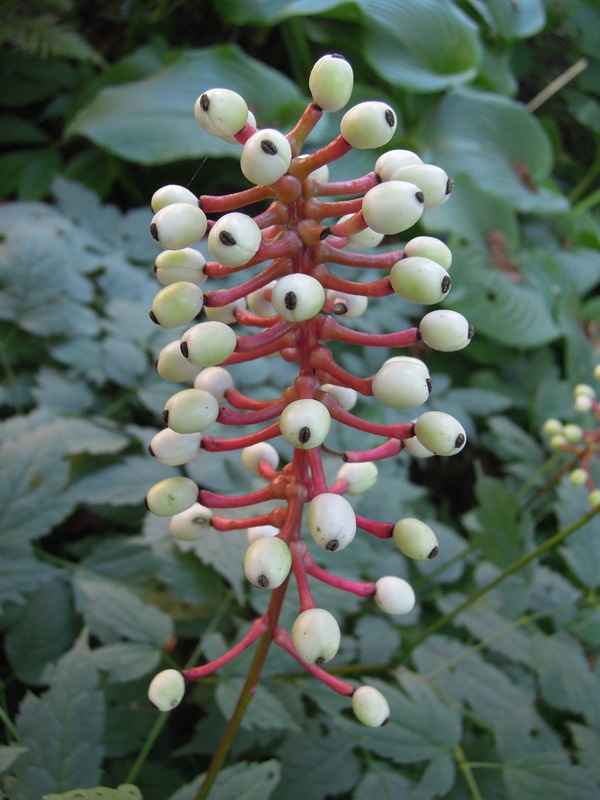 These plants not only add color to the garden, but are considered by some the only ones worth allowing to bloom (an opinion not shared by us). Like most hostas, the flowers range in color from white to shades of lavender and purple, but do tend to be somewhat larger and showier. 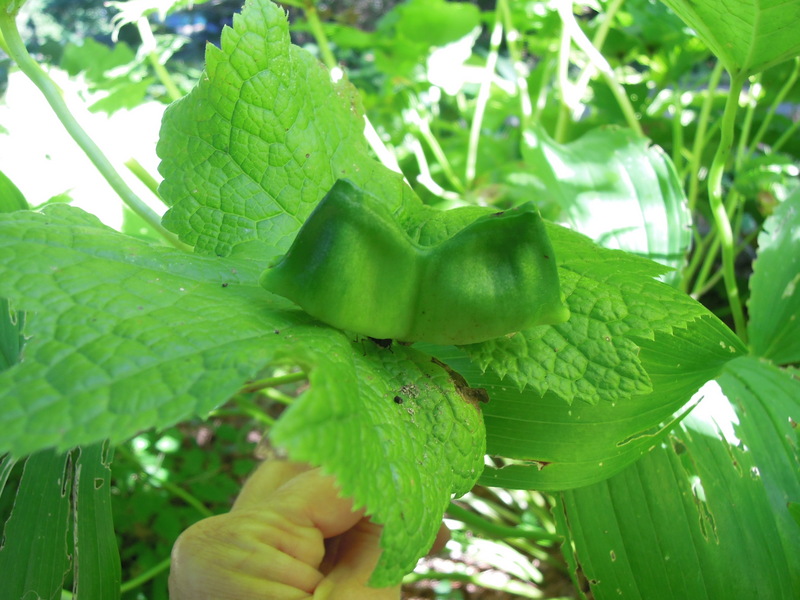 The largest and showiest is all is H. plantaginea. 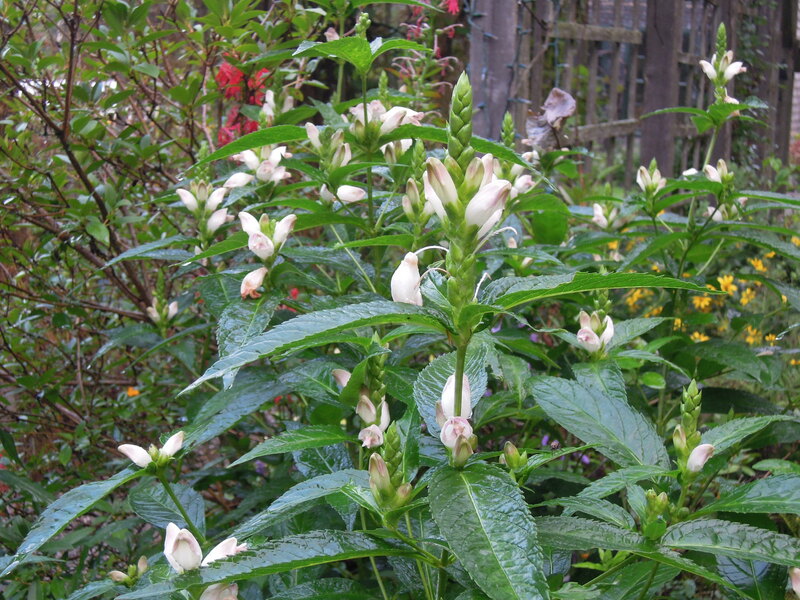 With pure white flowers up to 6” long, strong fragrance, and being of fairly large size, it is a very impressive plant in the garden. Since it is the only species that is fragrant, all fragrant cultivars available today are sports of, or are hybridized, with the genes of H. plantaginea in them. Currently there are around 60 or so cultivars that are listed and registered as fragrant. The reality is that some of them are not great growers and some are certainly more fragrant than others. 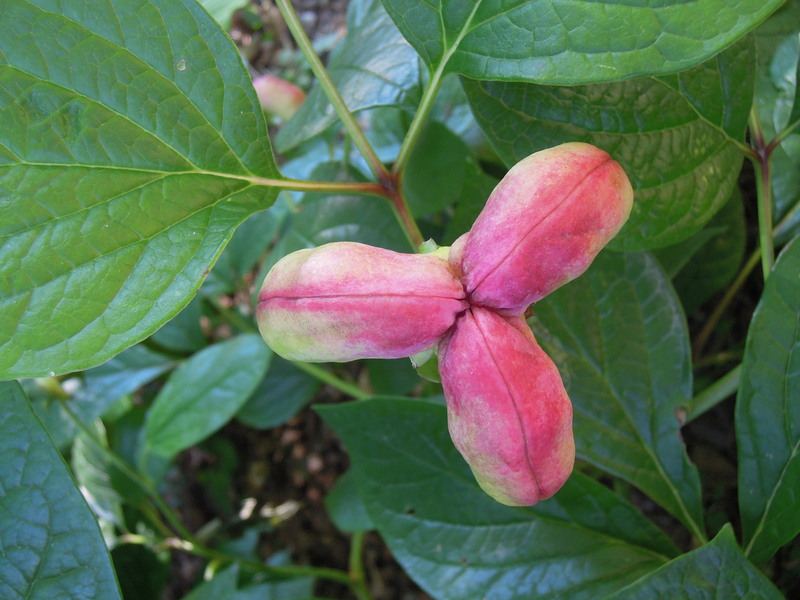 H. plantaginea is native to southern China and therefore is more tolerant of heat and sun. Here in the north it is a good idea to plant it and all of its derivatives in a warmer and sunnier spot in the garden than other cultivars. This promotes better growth and heavier flowering. Also keep in mind that pathways, decks, open windows, and patios are excellent choices to take advantage of the fragrance. The strongest fragrance is usually in the evening. 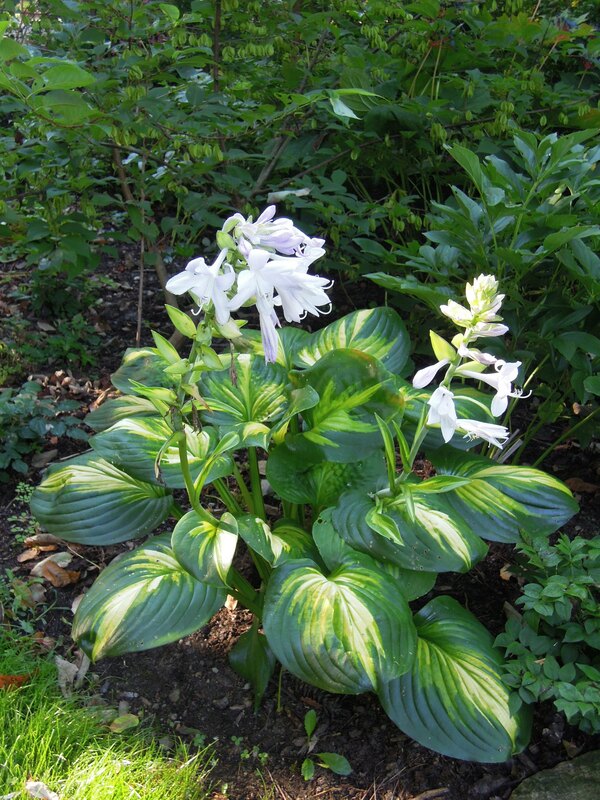 With all of the work that has gone into hybridizing hostas, many of the fragrant ones combine exceptional foliage qualities as well and are very desirable even if not fragrant. Some of my favorites, besides H. plantaginea , are ’Fragrant Queen’, ‘Cathedral Windows’, ‘Stained Glass’, ‘Sweet Innocence’, ‘Austin Dickinson’, and ‘Royal Standard’. This weather has been delightful. Still somewhat summer, and a bit of a turn towards falls. We are able to get so much done outdoors, our energy does not get so depleted as it would when the temperatures reach those high eighty marks. Still, we wander the gardens collecting seed. Before going out to do just that…….a few pictures of what’s being harvested from the display gardens. In the spring we enjoy the wonderful blooms of the woodland peonies. 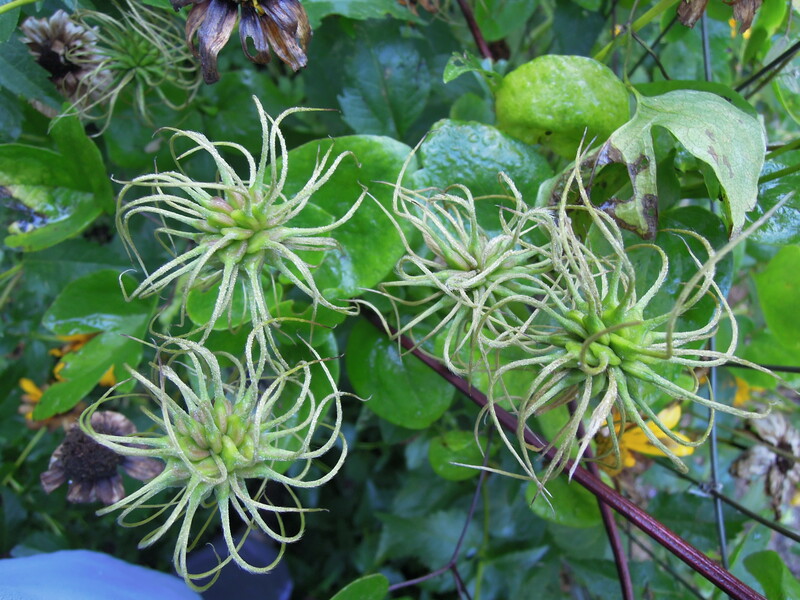 In the fall, we are amazed by the brilliance of their seeds and seed pods. 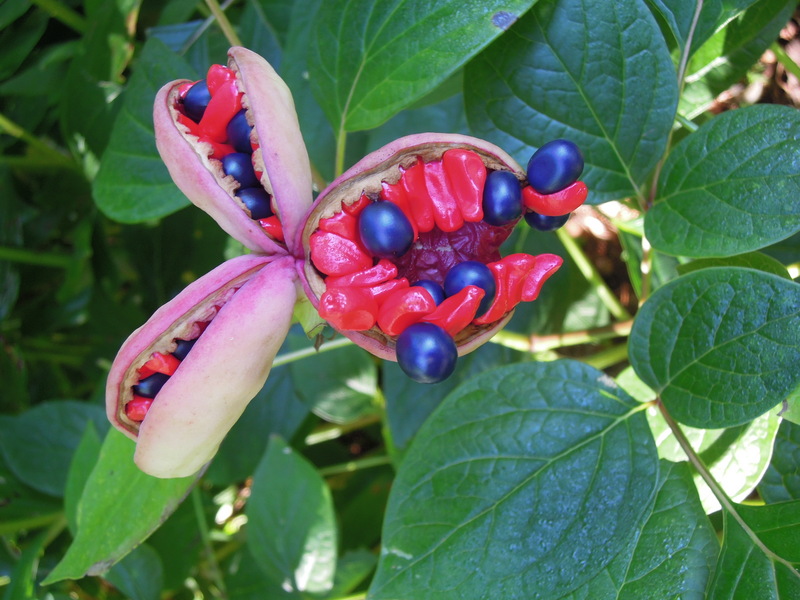 As we collect seed from the many woodland plants we grow here at Fernwood, we find the diversity of color and texture of the seeds to be quite remarkable, each plant having its own design. Nature……truly amazing and always full of wonder. It’s been a bit humid here, but there has been a slight breeze to help alleviate the feeling of being too hot and sticky. Watering the nursery becomes a pleasant chore, one can enjoy a little mist from the sprinkler system every now and again. Also, since most of what we grow are woodland, shade, and native plants, the nursery area is under a canopy of trees. It is always several degrees cooler up there. Wool wise, everyday a few more skeins go into the dyepot. It is truly something I look forward to …..this little bit of creativity a gift amongst garden and nursery work. 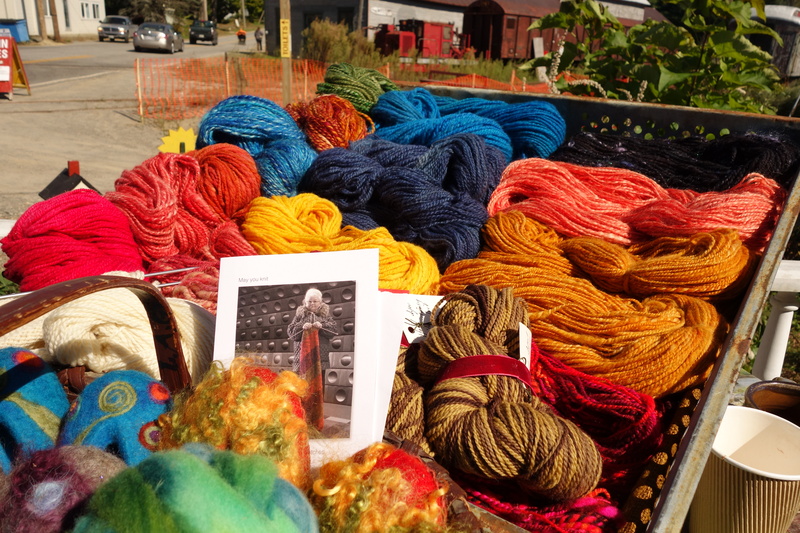 I think it is true for all wool loving people, knitters and spinners, probably weavers too, that with the idea of fall approaching, the urge to haul out your yarn stash becomes instinctive. I find that I am knitting everyday now, even on the hot and humid days. I start thinking of new felting projects and writing lists of the knitted garments I want to make. Like I said, everyday a few more skeins, everyday a few more knitted rows. 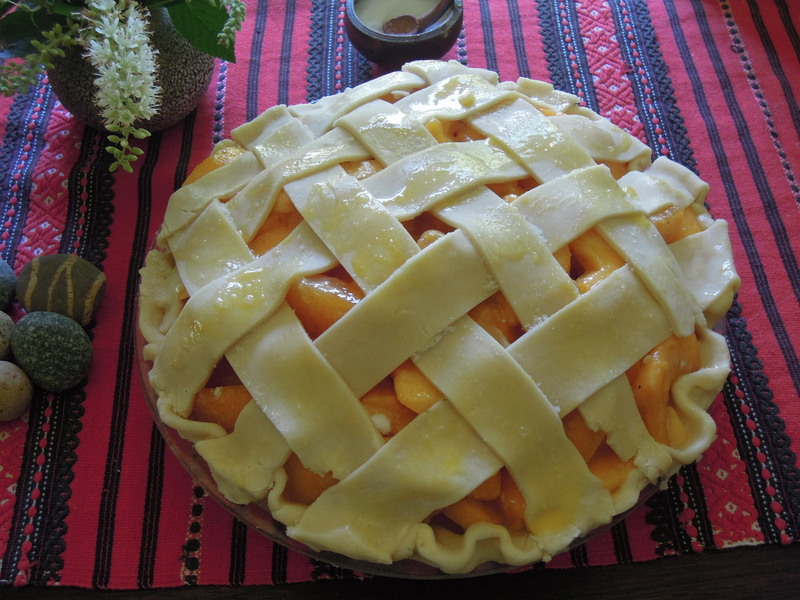 After freezing and canning all the peaches we are going to need this winter, a fresh pie was certainly in order. These peaches came from my friends tree. There has hardly been a year when that tree has not produced baskets full of peaches. I’m not sure of the variety, and Sue doesn’t seem to recall the name from when she planted it. No difference, it’s a honey of a peach tree. One of the great things about living amongst neighbors who share in the commitment and practice of self-sufficiency, is that lots of food gets bartered between farms and households. Sue had lots of extra peaches, I have an abundance of beans and tomatoes. Something got after her greenbeans early on, and blight has done a number on the remainder of her tomatoes. No problem. That’s why living with many diversified farms nearby can help you out of a tough spot. I am at the end of tomato canning and can’t squeeze even one more package of frozen beans into the freezer. Dilly beans already take up substantial room on the pantry shelves. So, peaches for beans and as many tomatoes as you can carry? Sweet deal! This kind of bartering is almost always in motion here in our community. Especially during the growing season. Why not feed yourselves and some neighbors along with it? 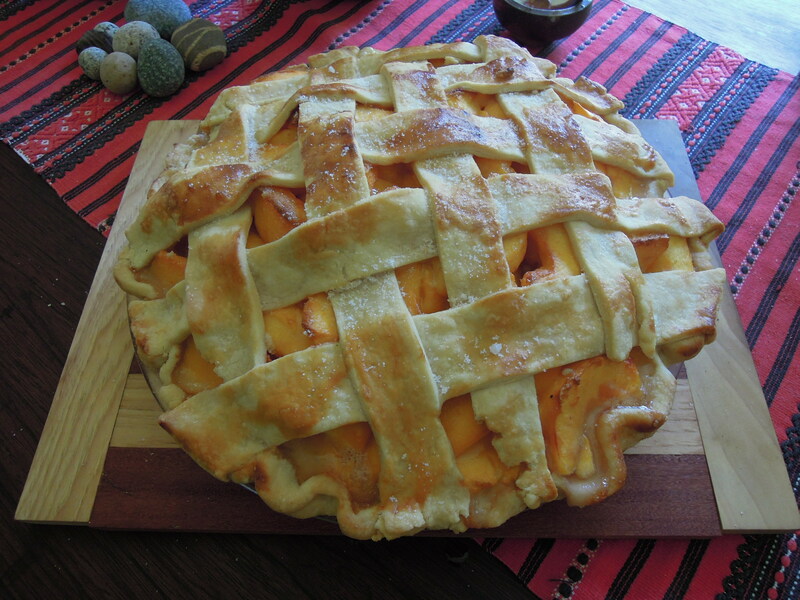 Tonight, we feast on fresh peach pie and some homemade vanille ice cream. Thanks to my neighbor! So much change! Yes, the seasons……. we’ve talked about that. At the moment, the big changes we are feeling happen to be the ones experienced by our family. First, no one in our household is preparing for going back to school this fall. Noah has decided ( with our support) to postpone further schooling at the moment, and to do some traveling. He heads out this fall for the wild west, on his own epic adventure to see some of the country, visiting with friends and family and WWOOFing a bit along the way. His older sister has just changed jobs within the company she works for and has moved to the big city of Portland. This means………just two of us in the house this winter. Who are we going to feed? What am I going to do with all this food? It is great to see your children branch out into the world, to find their footing, to create their own independent life and to follow their dreams and aspirations. It is also a very significant mark in time. Excitement and sadness. Thrills and deep breaths. We can account for all the things that have brought us to this point, the stages of childhood, the growth, the life learning, that has nurtured and prepared them ( hopefully) for these moments of flight from their nest. They charge ahead with their very good intentions and work, and we try not to cling or hang on to them, keeping them from the world they are about to explore. Not keeping them from their worlds, their choices, their adventures, and their responsibility to learn and grow from all of these things. We are never far away, we continue to lend support ( and counsel them even when not solicited), and we will always be home to them. This is comforting. They are traveling away, but the nest remains intact. With food….lots of it actually. Ha, this will bring them back on occasion! I feel better. So, what will we do? Oh goodness, lots! More of what we do already and then find all kinds of new things to add to our plate. Indulge in things that have been put on the back burner for years, and explore some new horizons ( we may not even leave home for this, we hardly ever do). We’ll grow too! And of course, we have our very good life here at the farm and nursery. This will continue to keep us busy……. always. Speaking of the nursery, this wonderful native is in full bloom and bringing us pleasure at the moment. 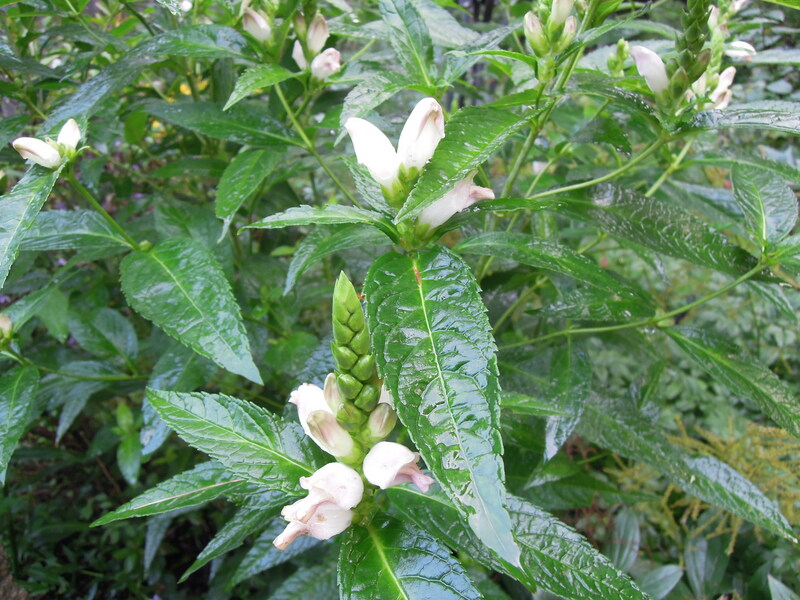 Turtlehead ( Chelone glabra) likes moist soil and part sun, it is long lived and blooms late summer through fall. 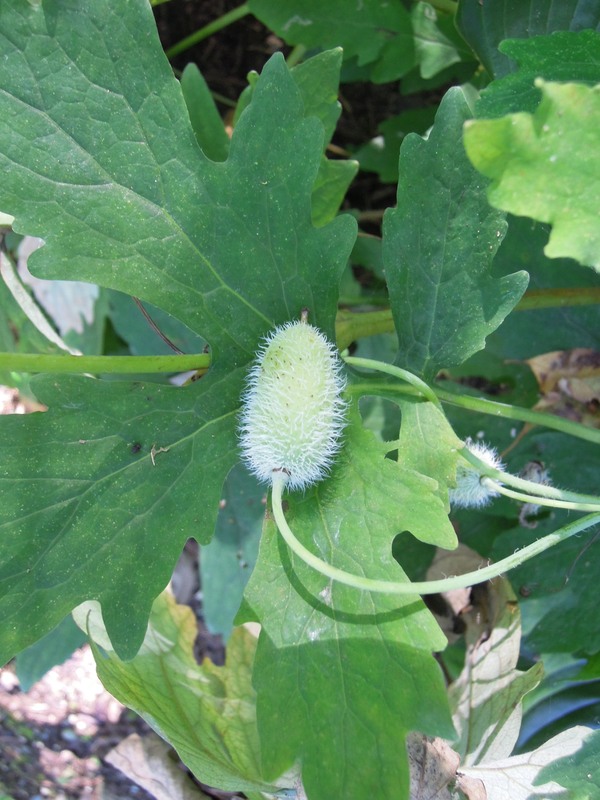 It reaches a height of about 2-3 ft. tall. Another variety we grow is Chelone ‘Hot Lips” which has blooms of very deep pink and darker foliage. Both are available at the nursery right now. In about ten days we will be traveling to pick up our new Blue Face Leicester ram. ( I guess we are going to be leaving home once in awhile!). Our current ram, Puck, will service a few ewes here before heading off to his new home and new flock of ladies. We are glad he’s going to a nice farm with hopes of improving the fleeces of their existing flock. Puck’s fleece is quite nice, and he’ll be sure to add some fine qualities to any wool. 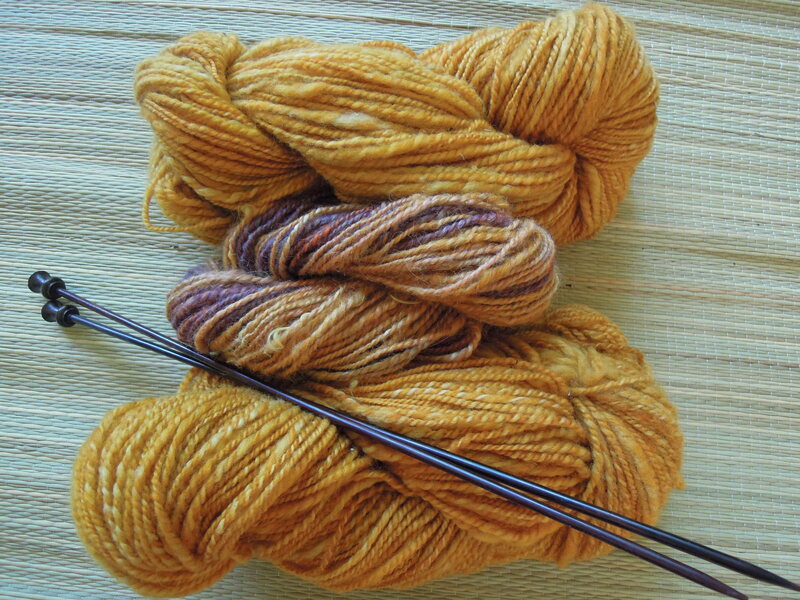 I will be selling yarn at a few locations this fall. During Commom Ground Fair weekend (Sept. 19, 20th, and 21st), I will set up the Teardrop over at my friends shop, Garden Variety, in Thorndike, Maine. 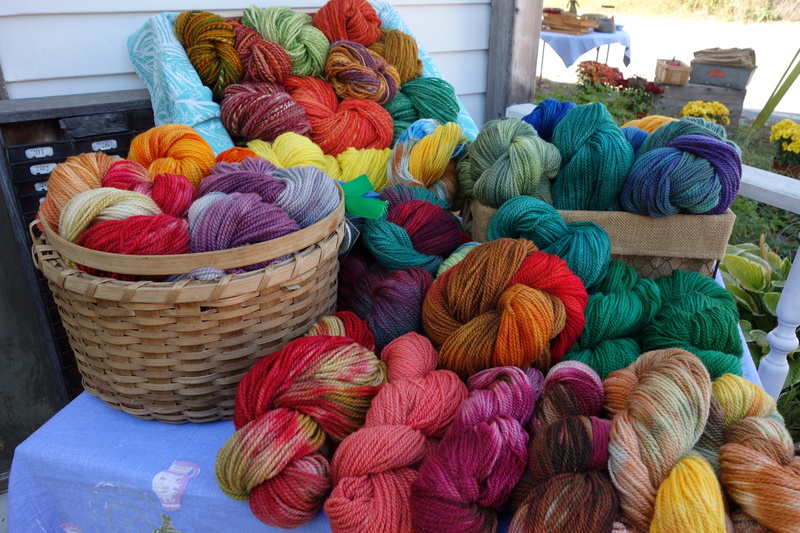 Lots of hand dyed, handspun yarn will be for sale, including the skeins that I had milled into yarn from Battenkill Fiber Mill. 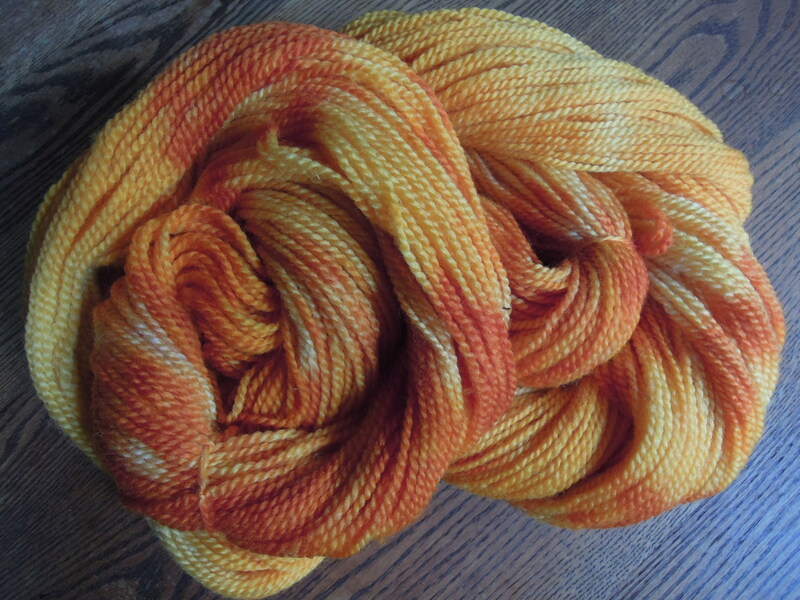 Plus, of course, my own handspun yarn. All of the wool is from our own Blue Face Leicester flock here at the farm. 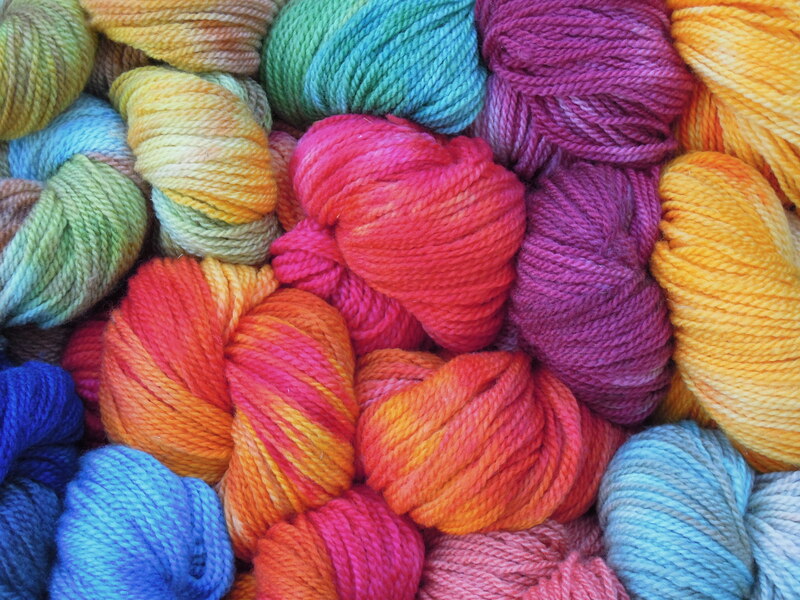 I will keep readers informed of other ‘yarn’ events, and people can continue to purchase yarn here at the nursery. 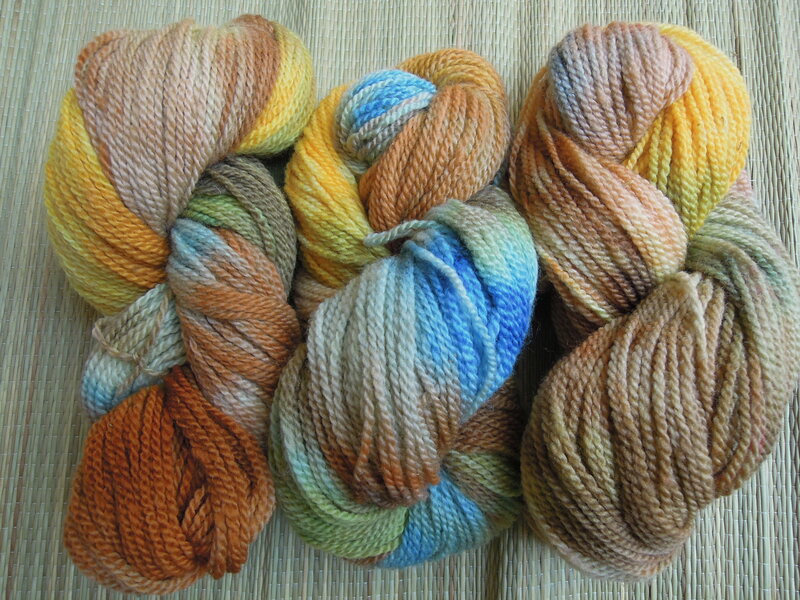 So these days, aside from all else, lots of dyeing and spinning going on! 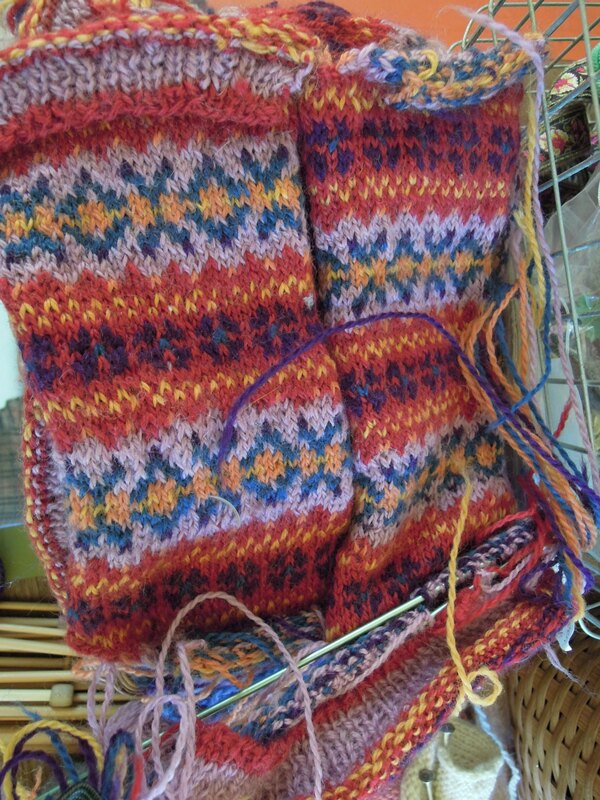 And on good days….a bit of knitting, too!